Historically, Tibet was divided into three regions: U-Tsang, Kham and Amdo and although all of them were part of Tibet, there were some notable differences in dialect and local customs. Tsawa Gang Dolma Lhakang is situated on one of the six famous mountain ranges of Kham known as Ku Lha. It is located in the region of Tsawa Gang in Chamdo which was part of Kham in the East of Tibet. 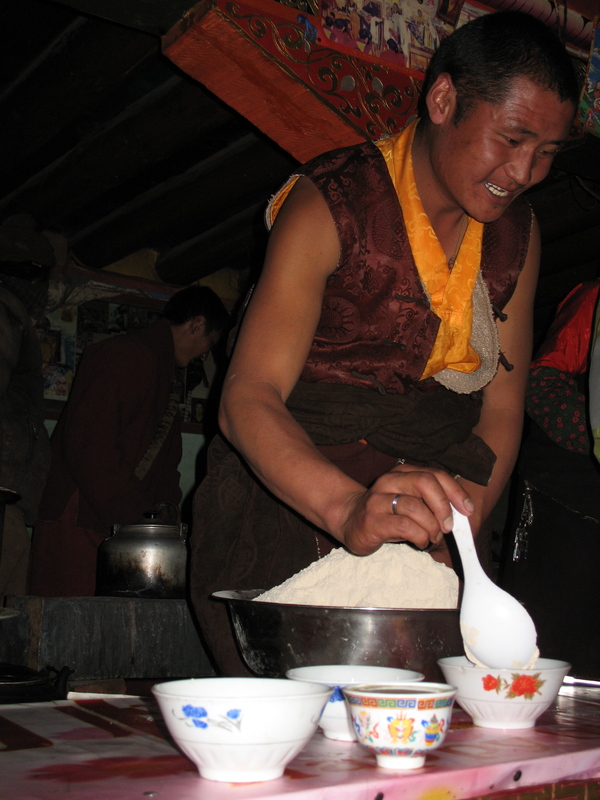 Nowadays it is within the Tibetan Autonomous Region. According to many texts Tsawa Gang Dolma Lhakang Monastery was founded in the 12th century by a disciple of Gampopa, Gyalwang Dechen Dorje, who was said to be the founder of 100 monasteries. It is situated in an area where there are many holy places, and in particular there is a hermitage far up on a rock in the mountains, located in front of a cave where Guru Rinpoche is said to have stayed and meditated. Many famous yogins and yoginis came to this holy place and practised or taught there. The second Akong Tulku Rinpoche himself did a retreat there. Originally there were no monastery buildings and the community practised and held retreats in nomad tents. It was not until the 17th century that the first monastic buildings were constructed from traditional materials. Today it is still possible to see self-arising mantra chains in rocks close to the monastery and even footprints left in the rock by high Lamas. There is also a tiny cave where it is said the twenty-one Taras appear to those with pure vision. The extraordinary and special Karma Miyo Sangpo, the first Akong, who was born in the area, lived in the monastery until he passed away in his 56th year in 1938, and later his incarnation, Akong Shetrup Tarap, was enthroned there when he was four years old. Like Kawa Karpo in Yunnan, where the 1st Karmapa, Dusum Khyenpa, attained realisation and then founded a monastery, Ku Lha is revered as a holy mountain. The mountain is sacred to White Tara, and it is possible for pilgrims to circumambulate it, which takes about two days. It has a roughly square base and on each of its four corners a nunnery attached to Dolma Lhakang monastery was built, each one facing a different direction. These are still in use but all now need replacing. Before it was destroyed in 1959 there were 300 monks and five nunneries plus several affiliated small monasteries and hermitages belonging to Dolma Lhakang. It was well-known for its learned scholars, its library of precious texts, a three-storey high Guru Rinpoche image and a Buddha image similar to the one in the Jokhang Temple in Lhasa. 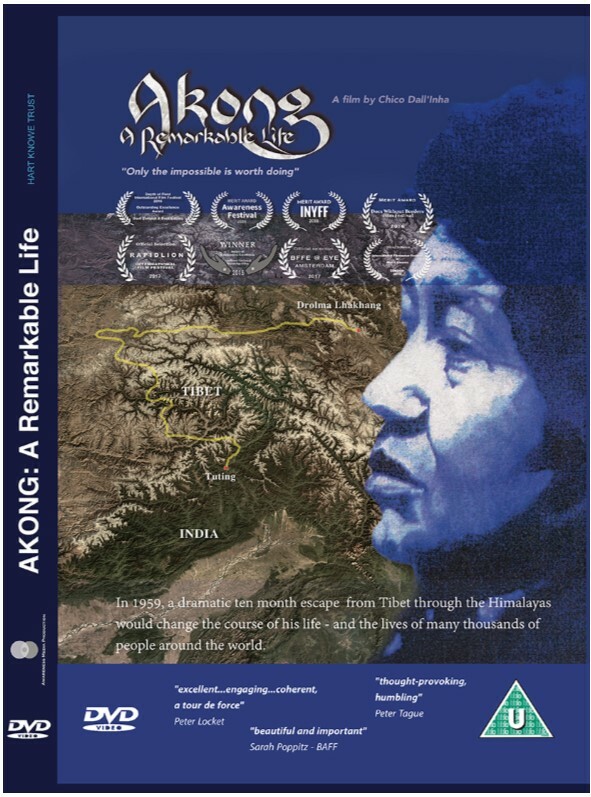 After his dramatic flight from Tibet to India in 1959, Choje Akong Tulku Rinpoche could not return to Tsawa Gang Dolma Lhakang until the 1980s and he found it in ruins. It was not until the end of the 1980s that he was able to start rebuilding for the first time, a task which, due to the impossibly difficult conditions, is ongoing today. “Drolma Lhakhang started as a hermitage about two hundred years ago and gradually grew into a monastery. There had been a succession of Ka-gyüpa mystics there, and it had always been a centre of hospitality to spiritual teachers, while many hermits lived in its vicinity. The whole monastery had an atmosphere of serenity and spirituality, wherein it differed from some others I have seen which seemed to be more institutional. At the time of my visit it held about one hundred and fifty monks. The building stood on a strip of land beneath a range of hills, at the junction of the river Kulha Shungchu and the Tsawa Auchu. Behind, on the further side of the hill, lay a whitewashed hermitage; its front wall supported on red pillars seemed to grow out of the rock. It had been built over one of the caves where the great guru Padmasambhava meditated after he had established Buddhism in Tibet. It appears that this hill had been known to very early men, for near the hermitage we found some primitive and curious rock paintings. They portrayed men on small horses done in red ochre and were protected by a surface that looked like talc. There was also an indication that very early Buddhists had lived near the site of the monastery, for at the end of the strip of land where it was built there was a single upstanding rock, and in one of its crevices sheltered from the wind and weather, there was a sculpture in relief of the dakini (female divinity) Vajrayogini. Across the river in front of the monastery rose the very high mountain called Kulha-ngang-ya which the people of the ancient Bon religion regarded as a powerful god and as one of the guardians of Tibet: his consort lived in the turquoise coloured lake below. Mt Kulha also figures in the story of Gesar of Ling, a famous hero who lived in the thirteenth century, the King Arthur of Tibet who also defended the faith against the unbelievers. The top of the mountain is always under snow and is known as the crystal tent of Kulha. Just before reaching the top one comes to a large cave, the floor of which is a sheet of solid ice; Akong Tulku, who had climbed up to it, told me that under the ice he had seen huge bones some of which appeared to be human, but were so large that they could not have belonged to any recent man.